Hi my name is Catherine and I live on the beautiful far south coast of NSW in a little town called Bega (Bega cheese is made here!). I’ve lived down here for about ten years now, I originally grew up in the Blue Mountains. I have a wonderful husband and two beautiful teenage boys - 13 and nearly 16 - and three crazy doggies. I work as a casual Primary School teacher and it keeps me very busy. In between everything I love to create my bags! I make fabric bags and purses for ladies. The fabric I use the most is home decor fabric as it is a heavier weight and more suited to a bag. I really love vibrant, colourful and eye-catching colours and designs that photograph well. I do use quilting cotton as well when I make lighter weight creations (such as a purse or make up pouch) and I really love the colourful designer fabrics - Michael Miller, Amy Butler and Riley Blake are among my favourites. I’d like to look at combining vinyl or leather with my fabrics in the future too and I really love how they can compliment each other. I get a lot of my inspiration from the internet - looking at other bag stores and products along the same lines as what I create. I love creative magazines such as Tickle the Imagination. Sometimes I will be lying in bed at night and a new idea will just pop into my head. I also tend to notice everyones handbags when I am out and about and sometimes I can draw inspiration from them as well. My creative process usually starts with the choosing of a fabric I love, then picking one of my many bag patterns that it would look beautiful with. I’ve been obsessed with art and craft since I was in primary school. I was always sewing, creating something or drooling over art and craft books. I did Art and Textiles in my HSC. I was originally a Graphic Designer and that is still my passion, but I have been a primary school teacher for about 8 years now (and love doing art with the kids) as there are more employment opportunities in that area. I started my bag making about two years ago now as I didn’t have much work on at the time and was feeling a bit bored. After giving some as gifts and using them myself, people suggested that I sell them. My local sewing shop lady told me about MadeIt and I decided to open a little store and have discovered a whole lovely crafting community in the process and I absolutely love it! Create and Thrive is a great website and I’ve also subscribed to a couple of the courses. Jess Van Den is a great inspiration and super knowledgeable about selling handmade online. I’m also a member of lots of handmade FaceBook groups as well. Watching you tube clips is a great way to learn techniques too. I also read whatever I can about online selling. Never, ever give up is my mantra - even when you feel like it sometimes - sales can often happen when you least expect it! And everybody has slow patches every now and then. It takes a long time to establish yourself and sometimes that first sale can take months - you have to be patient and prepared to work at it. I’ve only been open a year and a half and I have learnt so much in that time on how to improve my store. I am constantly reading about online selling and always trying to better my store, whether it is product descriptions, photos, pricing or marketing. Don’t undersell your beautiful handmade creations. It is tempting in order to make a sale, but if someone really loves your product then they will be prepared to pay a reasonable price for it! Social media is my number one marketing tool. I have a business FaceBook page, Instagram and Pinterest accounts too. I am finding Instagram the best for reach these days and using lots of hashtags really helps to build up followers. Whatever I post on Instagram, goes onto my FaceBook business page as well. Posting at least one a day really is ideal but I never seem to have the time to do this!! It’s also important to promote interaction by asking questions and encouraging people to interact. I think it is also important to answer any questions people may ask/message promptly as well. Good customer service is professional, invaluable and also encourages repeat customers. Having lovely packaging is a great way to promote your business and I always include a personalised note as well. Being featured in the MadeIt shopping guides always helps as well! Probably the worst thing I’m guilty of is trying to do too much at once and not saying ‘no' to anybody! You have to set realistic goals otherwise you just end up stressed out and tired trying to please everybody. I enjoy bike riding and also going for walks on the beach with my husband and three dogs. We are huge animal lovers in our house so the dogs are well cared for and very spoilt! I also enjoy watching my boys play soccer on the weekends. Books: I love reading and always have a book on the go. I like crime/suspense/mystery type books and am reading 'The Brass Verdict' by Michael Connelly at the moment. Any type of relaxing with no housework, noise or interruptions would be my perfect day. Just being able to lay back and relax with a good book or a great movie would be lovely (and of course all meals cooked for me!). 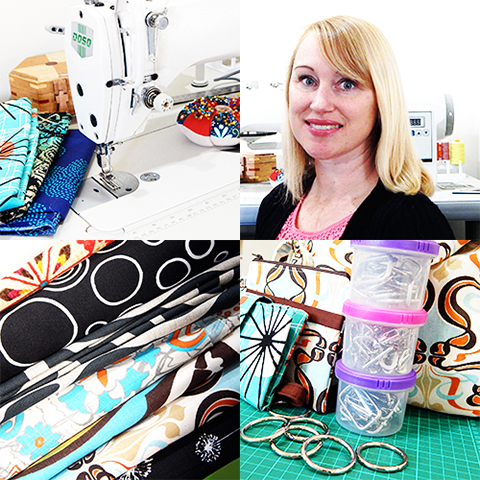 Annie Zorzo Accessories - not only is she incredibly talented with stunning creations, she is a lovely, helpful fellow bag maker as well!